Beneath the "city within a city" that is Rockefeller Center, there lies a whole mini metropolis known as the Concourse. Lined with shops and restaurants, it also holds a box office and entrance to Top of the Rock, as well as ATMs, a post office and a passport renewal counter. 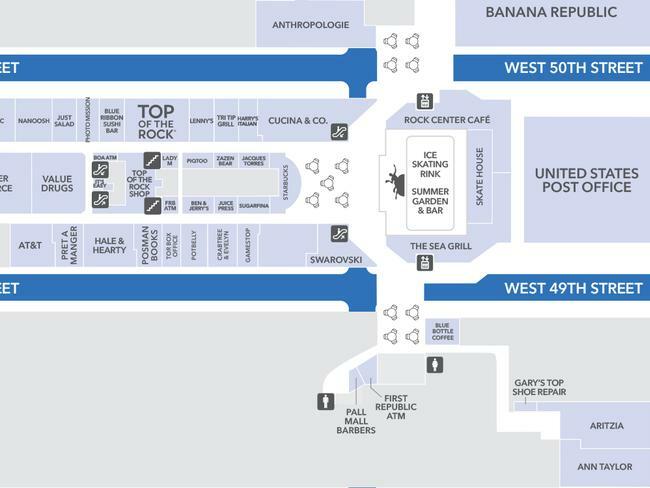 Use the map above (and this full version) to help navigate 30 Rock's vibrant subterranean level, and consult with the Rockefeller Plaza map (full version here) for the above-ground layout. The Concourse can be accessed directly from 47-50 Sts/Rock Center subway station at Sixth Avenue, where the B, D, F and M trains stop. There are also outdoor elevator stations on either side of the Rink (or Summer Garden in season), on 49th and 50th Streets between Fifth and Sixth Avenues. Entrances can be found as well in different Rockefeller Center buildings, including 30 Rockefeller Plaza (aka 30 Rock) pictured above with lobby stairways in yellow and escalators in blue. There's no shortage of coffee in the Concourse, with two Starbucks at either end, as well as Blue Bottle Coffee, tucked away south of the Rink, plus Jacques Torres with espresso, hot chocolate and combinations of the two. Food choices abound, ranging from the new Blue Ribbon Sushi Bar to healthful Mediterranean fare at Nanoosh to Cucina & Co. Italian and soups and sandwiches at Hale & Hearty and Pret A Manger. Shoppers can check off their lists with a new read at Posman Books, bath and body products at Crabtree & Evelyn, souvenirs at the Top of the Rock shop, paper crafts, cards and gifts at Paper Source, nifty tech finds at Brookstone, playful Japanese characters at P!Qtoo and crystal jewels at Swarovski. There are handy services as well, such as shoe shines at Eddie's Shoe Repair, passport and license renewal at It's Easy (between the central escalators), First Republic Bank ATMs (the bank is above ground) and a branch of the U.S. post office between the Rink and Fifth Avenue. Another lifesaver is Value Drugs, with its pharmacy and selection of health and beauty items, school supplies and snacks. This level also holds the skatehouse entrance to the Rink, and both The Sea Grill and Rock Center Café, with windows looking out to wintertime skaters. Seating areas south and west of the Rink provide a welcome opportunity to relax, and public restrooms are available on both the north and south sides of the Concourse. Also check out the Top of the Rock app and its Wayfinder feature to map locations around the complex. Now you're all set. And remember, while most people are drawn to Rock Center for its glorious outdoor sights—such as the world-famous Christmas Tree—those in the know frequent the Concourse for its array of excellent finds and conveniences, as well as the comfortable underground passage it provides—warm in the winter and air-conditioned in the summer. See the Purely Practical Guide for more information on visiting Rockefeller Center.